President-elect Cde Emmerson Mnangagwa's inauguration has tentatively been set for this Sunday if no political party challenges the election results by Friday. Government has since started inviting dignitaries who include diplomats accredited to Zimbabwe for the inauguration of the President-elect. "The Ministry of Foreign Affairs and International Trade of the Republic of Zimbabwe presents its compliments to all Heads of Diplomatic Missions, International Organisations and Honorary Consulates accredited to the Republic of Zimbabwe and has the honour to invite the latter to the inauguration of the President-Elect of the Republic of Zimbabwe His Excellency Cde Emmerson Dambudzo Mnangagwa which is scheduled for Sunday 12 August 2018 at the National Sports Stadium at 1030 hours," reads a circular from the Ministry of Foreign Affairs and International trade. "The ministry would like to stress that only Heads of Missions are invited to the inauguration ceremony. The Ministry of Foreign Affairs and international Trade of the Republic of Zimbabwe avails itself of this opportunity to renew all Heads of Diplomatic Missions, International Organisations and Honorary Consulates accredited to the Republic of Zimbabwe of its highest considerations." The Secretary for Foreign Affairs and International Trade Ambassador Joey Bimha confirmed the date which he said was subject to variation should there be a court challenge by any presidential candidate. "Indeed that is the intended plan. That is the tentative date if there is no any court challenge. "We will follow the Constitution as a law abiding Government," said Mr Bimha. Constitutional Court has declared them to be the winners. (2) The incumbent President continues in office until the assumption of office by the President-elect in terms of subsection (1)." (c) upon the assumption of office by a new President." 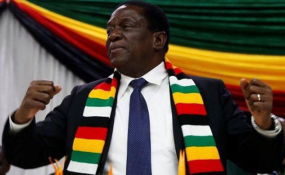 President-elect Mnangagwa won the presidential elections in the just ended harmonised election when he beat his closest rival, Mr Nelson Chamisa. Mr Chamisa has said he intends to challenge the presidential election results which he claim the Zimbabwe Electoral Commission rigged in favour of President-elect Mnangagwa. This is despite that both local and international observers including some senior officials from his party had endorsed the polls as free and fair.